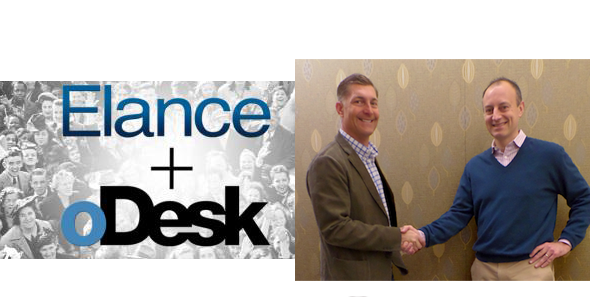 As you may know by now, Elance and oDesk, both well renounced freelancing platforms have called upon a merger. The news become a bit hit in the Freelancing world leaving millions of freelancers left behind with questions that the companies decided to reply to. Below, we have compiled all those FAQs that you may have regarding the big move by the freelancing platform giants. FAQ #1 Why Did oDesk and Elance decide to merge together? The companies announced that they took the step as it made sure that together they could have the investment to build a better platform that could provide more useful technologies and tools to serve freelancing world. Below in the screenshot we took, where oDesk folks explain what could this merger possibly help them with. FAQ #2 What is the vision for the new combined company after the merger? The company explains by giving the example of the big established giants like Amazon and the way it reinvented retail. The way Apply revolutionized the music industry using iTunes, just like them, the merged companies are looking to bring the freelancing world to a whole new level where people can find the best talent from regardless of their locations and talented people would find it far more easier to land a job for them selves. FAQ #3 Will this change have any effect on current freelancers/clients on oDesk and Elance? The companies clarifies that both the companies would continue to serve their clients and freelancers and their profiles and all, nothing would be changed. It would be technically the same world for everybody. Once the merger is all set and stoned, users can expect a much more accelerated quality and product innovations that will help both Elance and oDesk to continue serving you even better. FAQ #4 How will the two platforms evolved so they become more differentiated? The companies will be actively taking in the feedback from the users (clients and freelancers) to improve the experience at both the companies to serve the users even better. FAQ #5 Will this mean a tougher competition to land jobs after the merger for the freelancers? oDesk blog explains who both the companies would continue to serve just like before and there would be no changes to the marketplaces. So the current scenario of the competition would continue as it is with no difference on any of the two platforms. FAQ #6 Amount of business happening on both the platforms? Freelancers will earn a combined amount of 750 million dollars on both the sites as per the amount from oDesk CEO explains. FAQ #7 How does the new company fit into the overall hiring and staffing industry? Below is the screenshot from oDesk's CEO replies to some of the most asked questions about the merger. FAQ #8 How does the leadership will change for the new company? FAQ #9 What will be the new name of the company? The name is yet to be decided by the companies elites once the merger deals are all done. FAQ #10 Will any of the current feature people are using will fade away? As per normal improvements that the companies keep introducing in for the betterment of the users, there wont be any vital part going away such as profiles, login information etc. Client handling and job hunting process will remain the same as before. FAQ #11 Will there be any new membership fee structure introduced for the new company? oDesk CEO explains that there is nothing such planed for now. FAQ #12 What's the expected date of the closure of the final deal? Its expected to be closed with in 4 months as the oDesk CEO explains. What Does the new change could be for? After going through tons of stories online and view points, i believe there is little to be changed on the lower level where how clients and freelancers work. The deal was majorly done on the basis of expanding the business on a broader prospective so to increase the monopoly of the two companies in the freelancing world, so that they could emerge as a vital organ of the online hiring and staffing industry. Do let me know your concerns that you may have any other then addressed the oDesk CEO here. Peace out. BloggingeHow | Making Blogging Simpler: 12 FAQs Answered About Elance-oDesk Merger. What Could it Mean to You?